This entry was posted in Biological, Caroline Leaf, Psychological and tagged anti-depressants, anti-psychotic, caroline leaf, cognitive neuroscientist, false teacher, human rights, mental health, mental illness, pseudoscience, psychiatry, Robert Whitaker, schizophrenia, suicide, United Nations by cedwardpitt. Bookmark the permalink. Dr Pitt, the peak risk time for people with mental illnesses committing suicide is on the day of release from a psychiatric ward and in the following three months. As mental health staff know, the mental health systems of the world are inhumane. It’s important for mental health staff, as soon as possible, to advocate and demand rights for people with mental illnesses and start to work in ways that support them. At present, the health toll on mental health staff is also far too high. Mental health systems are bad for everyone – both patients and staff. God bless you. Thanks for sharing your opinion. I’m not ignorant to the complications inherent to modern mental health systems. They’re certainly not perfect, and they can always be improved. However, just because modern mental health systems can improve doesn’t mean that they’re inhumane. The treatment of mental illness is complex, time-consuming and resource-intensive, and is constricted by societal stigma and fiscal cachexia. The majority of mental health staff do an amazing job with very challenging presentations in spite of the limited resources, and the lack of the recognition or rewards that they deserve. I’ve not heard the statistic that you quoted, that the greatest risk of committing suicide is on the day of release from a psychiatric ward and in the following three months, but even if we take that as a given, there are alternative explanations. Patients who have been in a psychiatric ward are at the severest end of the disease spectrum which, in and of itself, places them at a higher risk of suicide, and the movement from intensive supports to more basic supports creates an extra layer of vulnerability. The suggestion that the increased suicide rate after discharge is related to the care itself is a post hoc fallacy. It’s like saying that the increased risk of death after surgery must be because of the quality of the surgery, or that people die after being read their last rites so it must be the last rites that are causing their deaths. You may feel that “mental health systems are bad for everyone”, which I also think is an overgeneralisation, but again even if that’s true, the answer isn’t to reject the model but to improve on it. Dr Leaf and her ilk would all have us believe that simply thinking better, holding hands and singing Kum By Yah, will somehow magically alleviate all the distress that mental illness brings to our world. That’s naive. The mental health systems of the world will never improve if we listen to such stigma-inducing ignorance. For me, the answer lies in the prevention and early treatment of mental illness through good primary care and appropriate social supports. 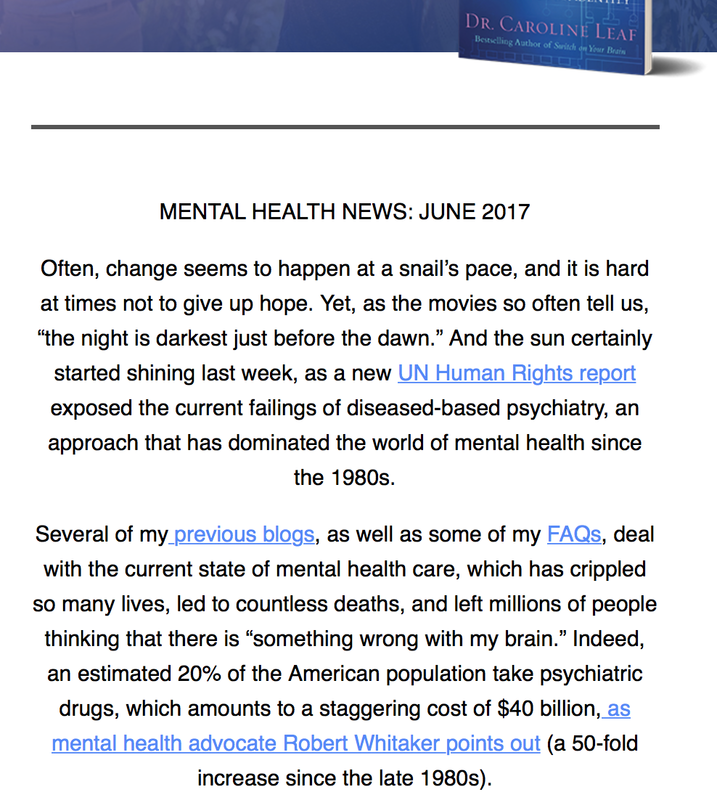 At the moment, governments are putting all the money at the end of the mental illness spectrum and not at the beginning. Mental health systems will improve as the science of mental health and illness is further elucidated, and as governments put more money into prevention and effective early management – to stop as many people as possible from progressing into full blown mental illness, to then free up the resources for those who do find themselves at the pointy end of the mental illness spectrum. Thank you for sharing your perspective on this very important topic. All the best to you.